Having a Great Sense of humor helps when your a real life Necromancer. Lisa Lee Harp Waugh gives the world an inside look at her Paranormal endeavors, her life with growing up in a small Texas town being haunted. And of course what spooks, spirits and other worldly beings she intends to call up in her future. Waugh isn't just a ghost hunter, she openly communicates with the dead. She does this by using tried and true rituals handed down through the generations from biblical times. Dressed in long white flowing robes this Texas native calls up spirits ghosts, Angels, and all the inhabitants from the other worlds beyond the grave. She asks them questions and gets answers. Waugh has set up her very own Paranormal Investigation web site The Ghost Hunters Of America (www.ghosthuntersofamerica.com). As a well salted investigator she has ventured into some pretty haunted areas in her life. From becoming a high ranking member of a secret Galveston, Texas Voodoo Society , to investigating a real Haunted Federal Prison with Ghost Hunter Paranormal Investigator from New Orleans, Gina Lanier (www.ginalanier.com). Over the years Waugh believes that no area of what people consider otherworldly, paranormal or just plain strange,weird or Ghostly should be investigated. During the past four decades Waugh has scoured haunted cemeteries, funeral homes, accident scenes and some very scary haunted locations in the great states bordering Texas. But she loves all that is related too Haunting's in Texas, Texas Ghosts, Texas Ghost Stories and all Texas Ghost Photos perk her interest. In fact she even lived near a real Texas ghost town and did several necromantic rituals their with some pretty startling revelations she admits. "Growing up in Marshall, Texas they use to find a lot of dead bodies," says Waugh. " Mostly murdered people and strange deaths." "My close friends use to hold seances to try to contact them to try to solve their murders." " This is when and where the bug for researching the paranormal first bit me." Marshall, Texas is a city of the northeastern region of the U.S. state of Texas. It is a major cultural and educational center in East Texas, and the multi-state Ark-La-Tex region. When speaking to Waugh her comments are often filled with her signature humor " I got that from my family, says Waugh, growing up in Texas and believing that you can communicate with ghosts you need a great sense of humor to get out of very sticky situations and conversations. " The city of Marshall was a political and production center of the Confederacy during the Civil War, and was a major railroad center of the T&P Railroad from the late 19th century until the mid-20th century. The city's large African American population and the presence of black institutions of higher learning made Marshall a center of the civil rights movement in the South. And of course next to Galveston it is considered the second Most Haunted City in Texas. Waugh believes and says, that's what originally made her move to Galveston. Her destiny.. and The Ghosts! This tells waugh is why ghosts have always been a part of her life. She says she remembers her first encounters. I WAS ABOUT 4 YEARS OLD OR 5, SITTING OUTSIDE DIGGING IN THE YARD. A LITTLE GIRL WAS PLAYING WITH ME, WE WERE HAVEING A GOOD TIME. HER NAME WAS SARAH. AND MY LITTLE DOG THAT I HAD WAS HAVEING A FIT, BARKING AND GROWLING. MY MOTHER CAME OUTSIDE AND ASKED ME WHAT WAS WRONG. I SAID THAT ME AND SARAH WERE PLAYING AND TIP, MY DOG WOULDN'T LEAVE US ALONE. MY MOTHER SAID, THERE IS NO LITTLE GIRL HERE, AND SURE ENOUGH, THERE WAS NO SARAH THERE. JUST MY DOG. AND FROM THAT DAY ON, I SAW PEOPLE THAT WERE NOT THERE, AND TALKED TO THEM. Once she became aware of seeking out ghosts or them seeking her out it was on Wiley Avenue and the second was on Grand Ave. (US 80) not far from where she lived. The ghosts where just there as real as people she tells. Then they just disappeared before her eyes. The city Of Marshall Texas is well known for holding one of the largest light festivals in the United States, the Wonderland of Lights. Each year The Wonderland of Lights in Marshall is one of the largest Christmas celebrations in the US and attracts tourists both from the US and other countries. The Festival of Lights and Christmas Festival in Natchitoches was started in 1927, making it one of the oldest Light Festivals in the US. The largest city. Candle light tours of historic haunted homes are popular attractions in. Kilgore suspends Christmas lights from oil derricks in the World's Richest Acre District. And you can find Waugh there with the glee of a child enjoying the decorations and hunting out a ghost or two as always. "I always want to go back one day and investigate the many ghosts at Starr Family Mansion in Marshall. " " Also much of Locust St is haunted, and the area in and around East Texas baptist university is full pf ghosts. " Waugh states. Waugh read every book she could find in the 1970's, from books on witchcraft, to Demons and Angels. It wasn't until the late 70's that she met a real Necromancer named Freebird in Galveston Texas that she knew what area intrigued her the most about the spirit world and Demonology." I enjoyed seances at the time growing up," says Waugh. " But I never put stock in Ouija Boards and and table tipping until Freebird came into my life." Freebird was a man of strange means, a Houston, Texas native and a hippy vagabond that had traveled the world in search of what Waugh thought of at the time as downright sensational. " I always wanted to delve deeper in to the occult I thought but with my upbringing I was adverse to witchcraft." But I was captivated by the Occult sciences of Calling the dead, and communicating with the unknown." Freebird was adept at this and saw in me the neophyte yearning for greater and deeper spiritual enlightenment." A photo of Lisa Lee Harp Waugh with what many paranormal Investigators call spirits or ghost around he,r or is it just a real actual ghostly halo that this Texan Necromancer happens to have! Many say she is the reincarnation of John Dee, Waugh does not confirm or deny this. A few even liken resemblance to his minus the facial hair. Free bird was in his late 50's at the time and as many of the period or in mid life, was in search of someone earnest and honest in beliefs to impart his great learned wisdom upon. The fates just happened to put Waugh in the right place at the right time. "Freebird taught me many things in the years of our associations." "From how to call up spirits with rituals, to invoking and banishing rituals common in Demonology and the works of Aleister Crowley ( Aleister Crowley was perhaps the most controversial and misunderstood personality to figure in the new era of modern day witchcraft.) and the famed John Dee (a noted English mathematician, astronomer, astrologer, geographer, occultist, and consultant to Queen Elizabeth I. He also devoted much of his life to alchemy, divination, and Hermetic philosophy.) ." "Freebird impressed me greatly with his psychic and paranormal abilities and knowledge of necromancy." He and I would go to Galveston Cemeteries late at night and call up spirits to appear much like John Dee and Edward Kelly's association in 1582. Dee's first attempts at calling u the dead were not satisfactory, but, in 1582, he met Edward Kelley. Dee took Kelley into his service and began to devote all his energies to his supernatural pursuits. These "spiritual conferences" or "actions" were conducted with an air of intense Christian piety, always after periods of purification, prayer and fasting. Dee was convinced of the benefits they could bring to mankind. (The character of Kelley is harder to assess: some have concluded that he acted with complete cynicism, but delusion or self-deception are not out of the question. Kelley's "output" is remarkable for its sheer mass, its intricacy and its vividness.) Dee maintained that the angels laboriously dictated several books to him this way, some in a special angelic or Enochian language. "The First time I saw a real spirit rise from a grave Freebird had to do all that he could to keep me from panicking to the point of hysteria and leaving the magical circle I was inside of for my protection...". Relates Waugh with a fevered pitch in her strong Texas drawl. " But I was really whole heartedly intrigued and wanted to be able too do this for myself." " I had hunted ghost before but until this time had never witnessed a full body apparition or communicated with a spirit eye to eye before." Over the years until Freebird's tragic fiery death, Waugh learned many things about the practice of Necromancy. " The man was genius except when it came to cooking he set his house on fire and almost took out a Galveston neighborhood in doing such." " I called on his ghost to communicate with me about a year after he died ." To my surprise he said he was making me a birthday cake when the oven exploded." Tearfully tells Waugh. " I miss him but I do not call upon him to talk to me except when I need his mentoring." As a professional Necromancer and founder of the Sorcerers Guild of greater Houston and Galveston, Texas. 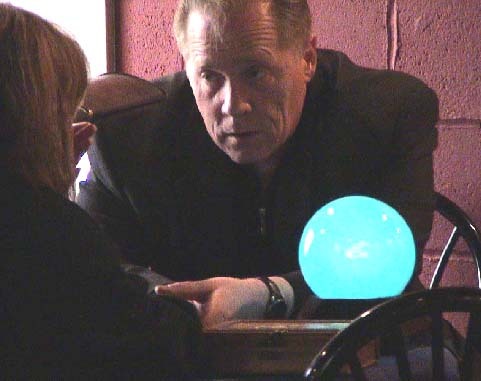 Waugh has been practicing and conducting rituals for many paranormal investigators for over 20 years. " I have to get to know the investigator well before I will conduct the ritual to call ghost in front of them." People need to be schooled as I was in what you can do and how you can question the dead before they attempt this." Many rules apply to the actual rituals and every thing should be done to perfection." " one slip up and the consequences could become dire." Waugh also paints many spiritual works of art focusing on the Ghosts and spirits that appear before her. Her painting are done with interesting detail;s and emotions. Many people are investing in owning an original Waugh these days. Many say all carry an aura of what is truly haunted. " One painting I did is said to be haunted, until others come forward and tell their tales of my artwork who can say that others are not spirit possessed like that one." Says Waugh. She also does many common murals and lives in a small Texas town with her three dogs. She also over the years makes ceremonial candles and is active in ghost hunting in the deep South with 5 different organizations. Summoning the dead to communicate with the living is a natural daily occurrence for Waugh.
" I love taking Ghost Tours like Dash Beardsley's Ghost Tour Of Galveston Island, Texas when ever I am there." "I have witnessed many ghost on his tour over the years. " I think because of my many years as a practicing Necromancer spirits and ghost now openly try to communicate with me where ever I am." Says Waugh. " Beardsley's Tour is one of the best in the country and I suggest when in Texas take the tour you might meet a ghost face to face Like I did!" Also :Lisa Lee Harp Waugh's choices for "The Most Haunted State In America"